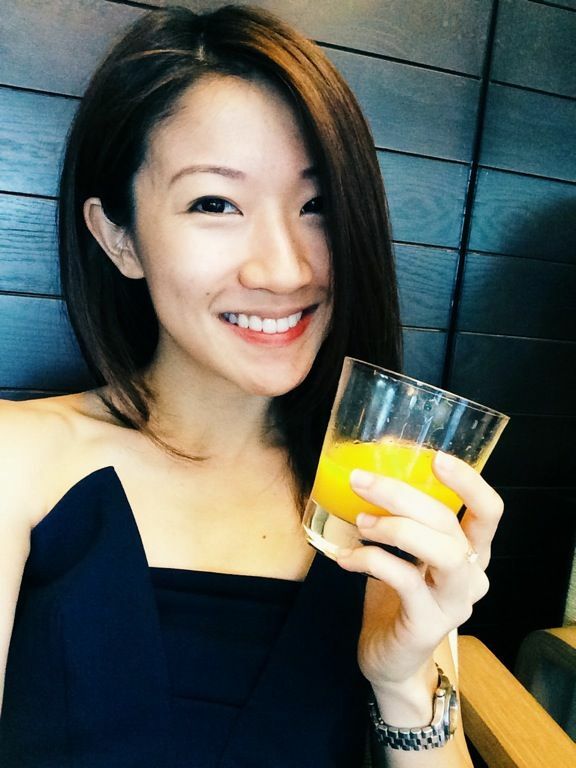 Could we do with more Japanese food streets in Singapore? For sure. 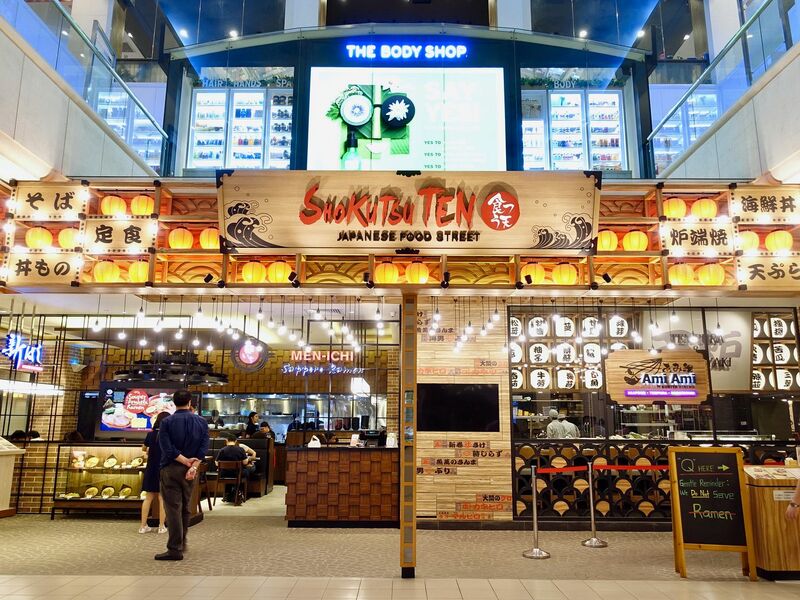 Shokutsu Ten Japanese Food Street has launched its third venue at Great World City, presenting a total of five food and beverage and retail brands under one roof. Sure it's slightly away from the main Orchard stretch, but you can easily grab a meal here and a movie even with the weekend crowd. Other than the existing Ichiban Boshi and Kuriya Japanese Market, 3 concepts are added. Check out new restaurants like Ami Ami and Men-ichi Sapporo Ramen, and also my old favorite Shimbashi Soba. 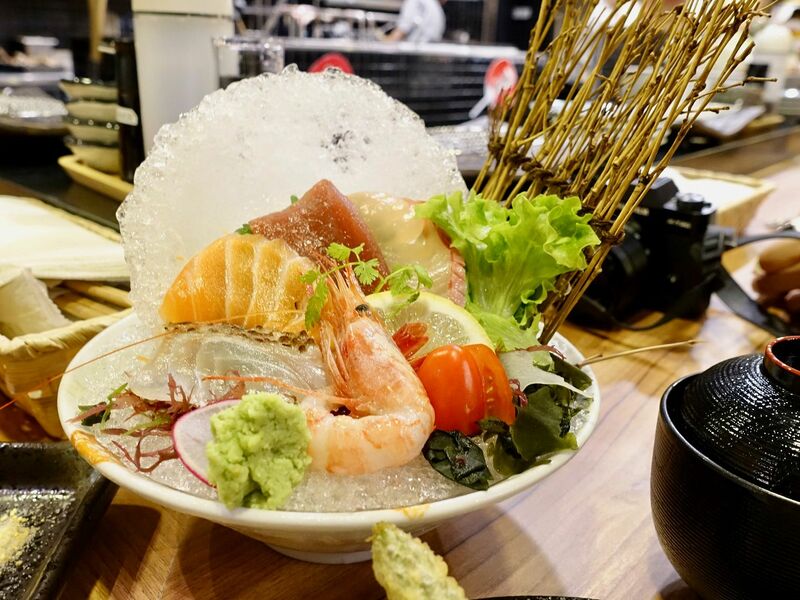 Ami Ami is a seafood restaurant helmed by award-winning Master Chef Naoki Tsuzuki, who amassed over two decades of culinary experience in Japan and Singapore. 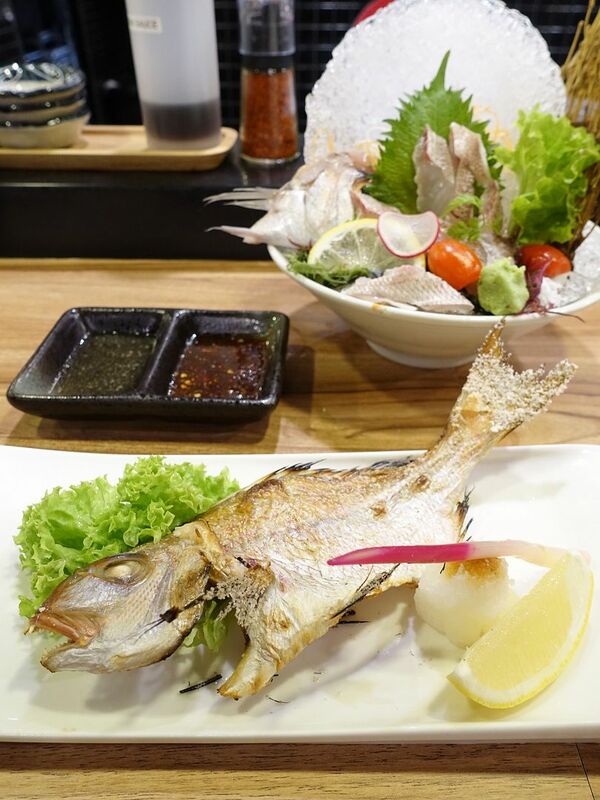 Seasonal catch of the freshest quality is air-flown from Japan thrice weekly, and prepared sashimi/robatayaki/tempura style. 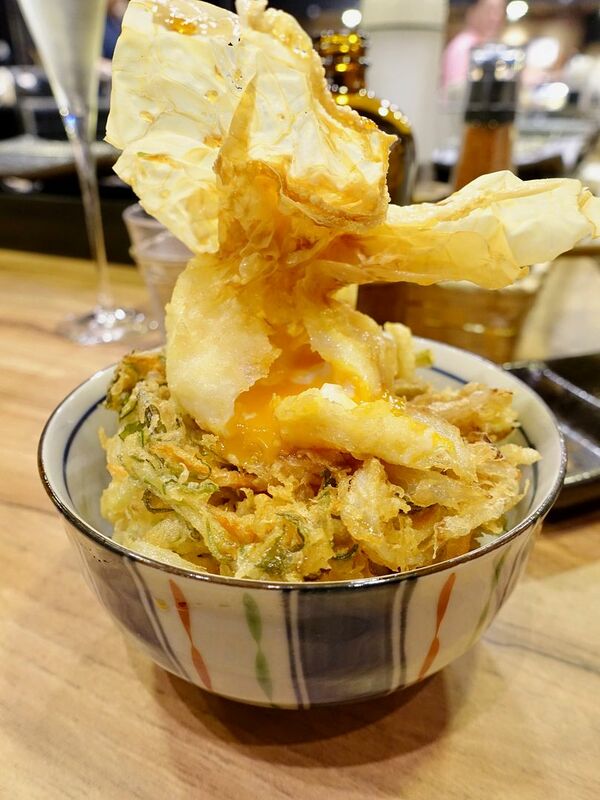 Over at the tempura counter, feast on fresh tempura that is deep-fried a la minute and served piece by piece. An original blend of sesame oil and soya bean oil is used to fry the tempura, giving it an additional fragrance and crisp. 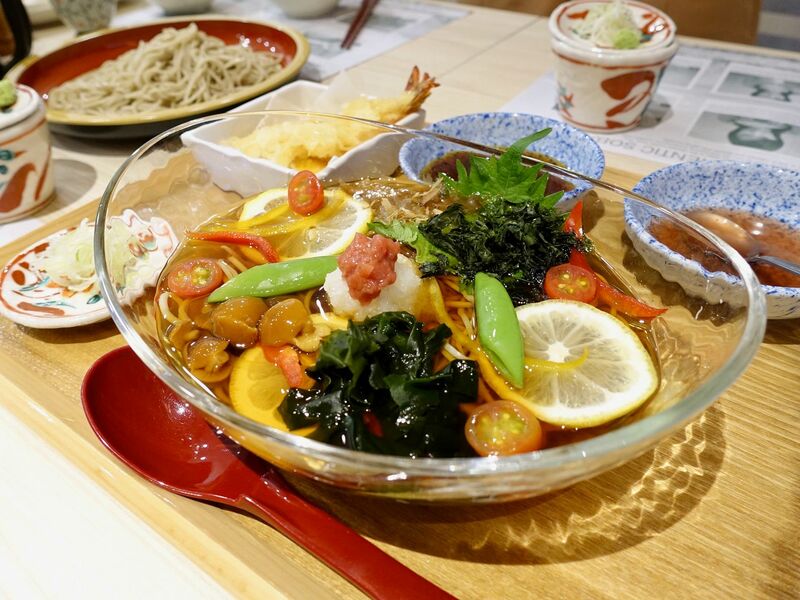 Go for the affordable set meals such as the Ami Ami Tempura Set ($45.80), which comprises fresh sashimi of the day, charcoal-grilled live scallop, assorted tempura, and the signature egg tempura served on a vegetable kakiage tempura rice bowl. The Original Egg Tempura (a la carte price at $6.50, served with rice) is a hit. This original creation by Master Chef Tsuzuki is an onsen egg wrapped in deep-fried beancurd skin. Poke it and let the runny yolk flow into the pearl rice. Before you eat it, make sure you give it a good drizzle of the tempura sauce. Over at the Robatayaki counter, seafood is grilled slowly over charcoal flame. Enjoy the Air-flown Fish Robatayaki Set ($24.80), consisting of charcoal-grilled air- flown seasonal fish, charcoal-grilled live scallop, and a selection of fresh sashimi served with rice. The Live Scallop Robatayaki with 3 Toppings ($19.80): crabmeat, sea urchin and salmon roe may tantalize the tastebuds of some but not me. These are best eaten fresh, not cooked, especially the sea urchin. For sashimi lovers, the 'Fuji' Sashimi 5 Kinds ($26.80 for two pax) offers an assortment of the season’s best and freshest seafood. We had the Maguro, Salmon (Norway), Sawara Aburi (Spanish Mackerel), Kampachi (Amberjack) and the Tai. I've always loved the thick, curly, and chewy Sapporo ramen which is cooked in a rich umami miso tonkotsu broth. I'm glad to report that Men-ichi Sapporo Ramen does a mean bowl. Using the traditional Sapporo method, bean sprouts, minced pork and leek are stir-fried together for that smoky wok hei, before topping it up with a collagen-rich, miso-infused tonkotsu broth. 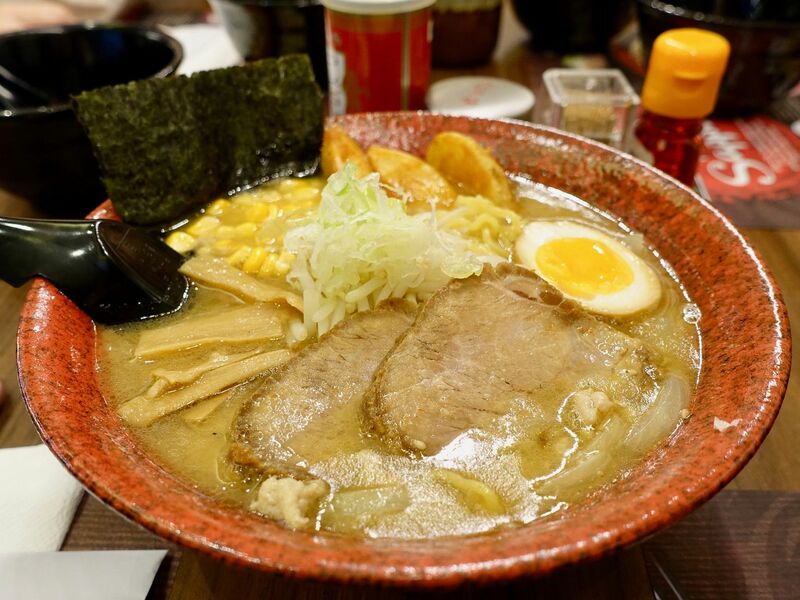 The rich broth is then served with signature thick, curly Nishiyama noodles specially imported from Hokkaido. Pick from 2 types of noodles of slightly different thickness. My preference is the thicker curly noodles which retains its chewiness better. 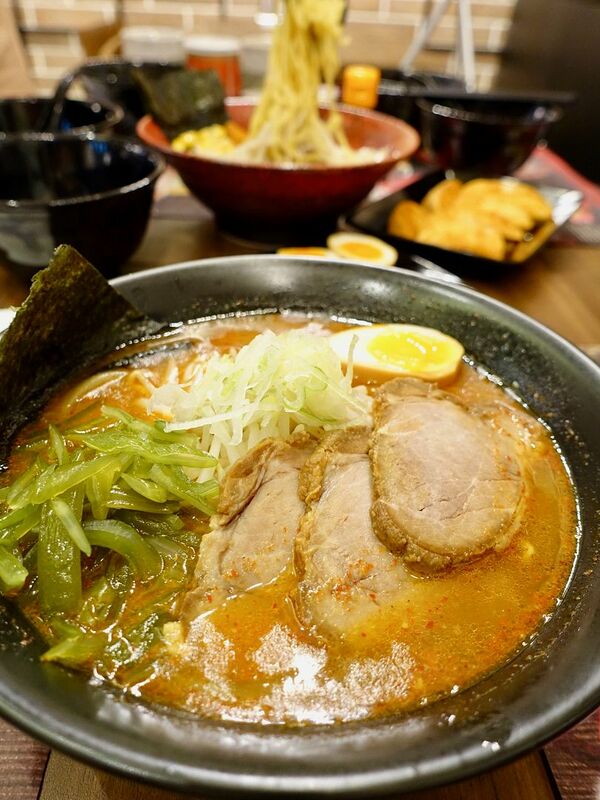 Go for the Tokusen Sapporo Miso Ramen ($19.50) if you love a wide variety of toppings. This one has 10 toppings of potato wedges, flavored Japanese egg, bamboo shoots, leek, bean sprouts, corn, seaweed and two pieces of charsiew. I really love the char siew meat here. It's from the shoulder of the pig and is cooked sous vide to seal in those lovely flavors. This cut is less fatty and has a lovely meaty bite to it. If you find miso too flavorful, there is also the Shoyu and Shio Tonkotsu broth to pick from, plus options to make it spicy too. The Sapporo Spicy Shio Ramen ($17.90/3pcs char siew or $15.90/1pc char siew) leans towards the Korean style of ramen imo and really packs a punch. Jr and i have been back to Men-ichi for another meal and he loves the Shio Tonkotsu ramen, while i remained loyal to my favorite Sapporo Miso Ramen. 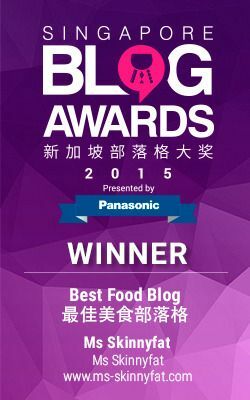 Oh and definitely go for more pieces of char siew! There's also the aburi version which you can order as part of a set or as a side dish. Shimbashi has been around before any of the other soba restaurants came onto the scene. Their healthy buckwheat noodles are made fresh daily using pesticide-free buckwheat from Tasmania. 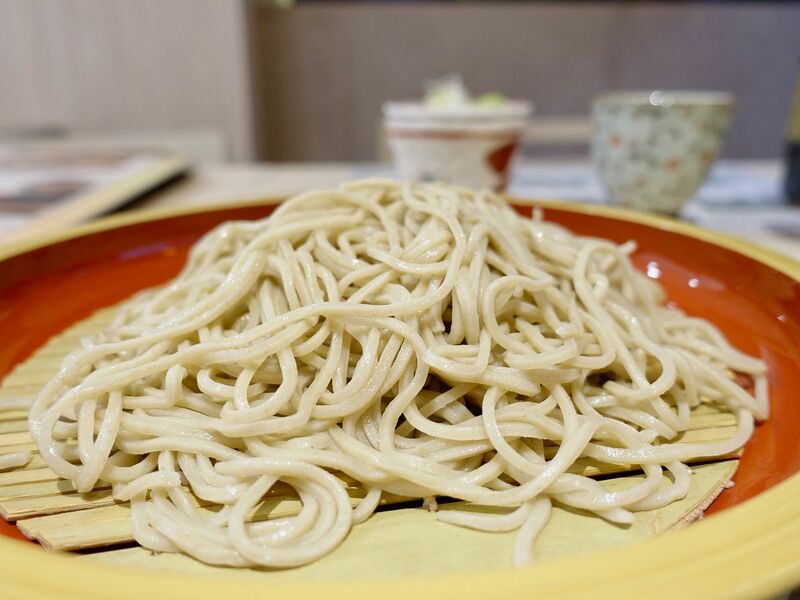 The buckwheat seeds are milled into flour from scratch at the restaurant and kneaded and sliced into fresh noodles. With 80% buckwheat used in the noodles, each bite is flavorful and satisfying. Helming the kitchen at Shimbashi Soba is Soba Master Yoshinori Shibazaki, who has more than 40 years of experience making soba in Japan and Australia. Enjoy a chilled (seiro) or warm dipping sauce (tsukemen seiro) depending on your preference. My preference? The Tempura Seiro ($20.80), a chilled plain noodle served with dipping sauce, prawn and vegetable tempura. The way to eat soba is to top up the leftover dipping broth with the soba yu (boiled soba water) for a nutritious end to your meal. 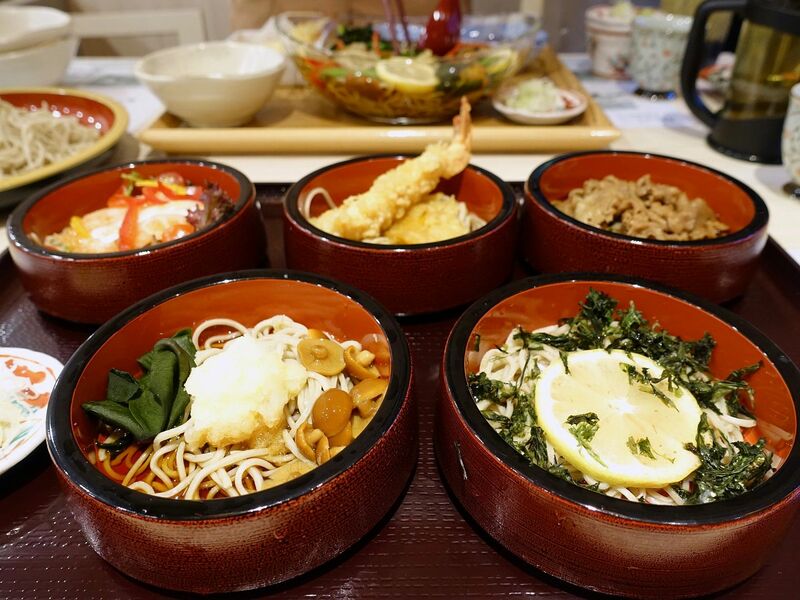 If you love variety, definitely order the chilled Warigo Soba ($21.80). 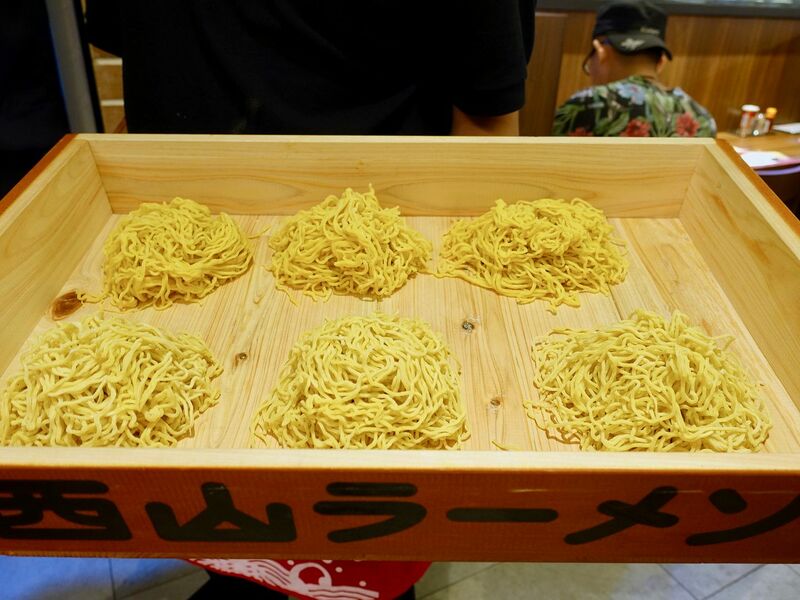 Exclusively available at Great World City, there are 5 mini bowls of noodles with different toppings. I couldn't stop eating the lemon-ume seaweed one. The tartness is very refreshing. The yuzu-radish one was also very lifting. Another signature soba to try is the Ume Soba & Prawn Tempura ($18.80) which can be served warm or chilled noodle. At the GWC outlet, you could choose either the handmade or machine made soba. Go for the handmade one duh. 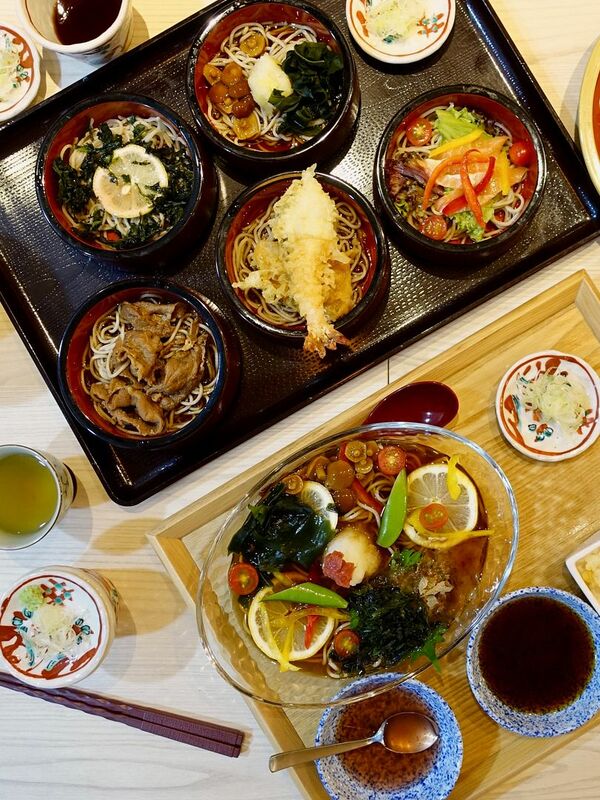 Definitely head over to Shokutsu Ten Japanese Food Street at Great World City for a good bowl of noodles or tempura.